Bakalar N (2005). “Earliest Bird Had Feet Like Dinosaur, Fossil Shows”. National Geographic News. de Beer GR (1954): Archaeopteryx lithographica. A Study Based upon the British Museum Specimen. Trustees of the British Museum, London. Bühler P, Bock WJ (2002). “Zur Archaeopteryx - Nomenklatur: Missverstandnisse und Losung”. Journal of Ornithology 143 (3): 296-86. Elżanowski A (2002): Archaeopterygidae (Upper Jurassic of Germany). In: Chiappe, L. M. & Witmer, L. M (eds. ), Mesozoic Birds: Above the Heads of Dinosaurs: 129?159. University of California Press, Berkeley. Griffiths PJ (1996). “The Isolated Archaeopteryx Feather”. Archaeopteryx 14: 1-26. Heilmann G (1926): The Origin of Birds. Witherby, London. Huxley TH (1871): Manual of the anatomy of vertebrate animals. London. ICZN Opinion 607 (1961). 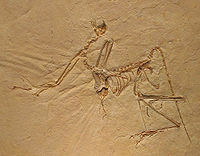 “Archaeopteryx Von Meyer, 1861 (Aves); Addition to the Official list”. Bulletin of Zoological Nomenclature 18 (4): 260-1. ICZN Opinion 1070 (1977). “Conservation of Archaeopteryx lithographica von Meyer 1861 (Aves)”. Bulletin of Zoological Nomenclature 33: 165-6. Kennedy E (2000). “Solnhofen Limestone: Home of Archaeopteryx”. Geoscience Reports 30 (1-4). Retrieved 2006-10-18. Longrich N (2006). “Structure and function of hindlimb feathers in Archaeopteryx lithographica”. Paleobiology 32 (3): 417-31. Nedin C (1999): All About Archaeopteryx. archive. Version of June 10, 2002; retrieved 2006-10-18. Olson SL, Feduccia A (1979). “Flight capability and the pectoral girdle of Archaeopteryx”. Nature 278 (5701): 247-8. Ostrom JH (1976). “Archaeopteryx and the origin of birds”. Biol. J. Linn. Soc. 8: 91-182. Ostrom JH (1985): Introduction to Archaeopteryx. In: Hecht, M. K. O.; Ostrom, J.H. ; Viohl, G. & Wellnhofer, P. (eds. ), The Beginnings of Birds: Proceedings of the International Archaeopteryx Conference: 9-20. Eichstatt, Freunde des Jura-Museums Eichstatt. Swinton WE (1960). “Opinion 1084, Proposed addition of the generic name Archaeopteryx VON MEYER, 1861, and the specific name Lithographica, VON MEYER, 1861, as published in the binomen Archaeopteryx Lithographica to the official lists (Class Aves)”. Bulletin of Zoological Nomenclature 17 (6-8): 224-6.
von Meyer H (1861): Archaeopteryx litographica (Vogel-Feder) und Pterodactylus von Solenhofen. Neues Jahrbuch fur Mineralogie, Geognosie, Geologie und Petrefakten-Kunde 1861: 678-679, plate V [Article in German]. Wellnhofer P, Tischlinger H (2004). “Das "Brustbein" von Archaeopteryx bavarica Wellnhofer 1993 - eine Revision”. Archaeopteryx 22: 3-15. Fred Hoyle; Chandra Wickramasinghe (1986年). Archaeopteryx, the primordial bird: a case of fossil forgery. Christopher Davies.